Today is a day of wreaths, my friends! I am guest posting a wreath on the blog of one of my favorite wreath-making bloggers EVER, Jill from Create.Craft.Love. Not only that, but I am also sharing a wreath tutorial with you here for this Swirled Flower Christmas Wreath, along with 14 other new and amazing wreaths from some of the most talented ladies in blogland. SCORE!!! 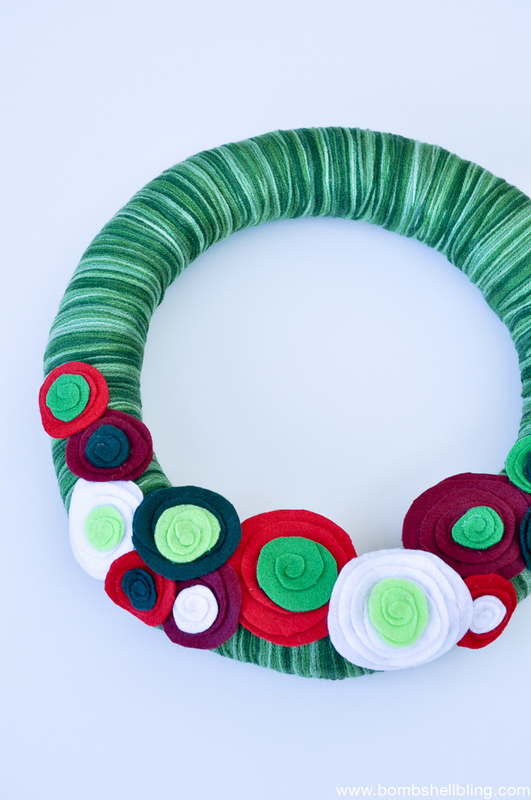 Before I share my tutorial with you, let’s take a peek at the other gals’ wreaths. To appreciate all the lovely details of each wreath, click on each of the links. WOOOOOOOW — right?!?! That first one especially blew me away. I know INSTANTLY that it was made by my dear friend Bev from Flamingo Toes. She is the vintage-y wreath MASTER! Now let’s talk about how I made my wreath. I actually made this wreath about four years ago, long before I was a blogger. I have no recollection as to where I found my inspiration, but I am assuming it was from an Etsy shop. That was at the height of my jewelry selling, so I spent a lot of time on Etsy. 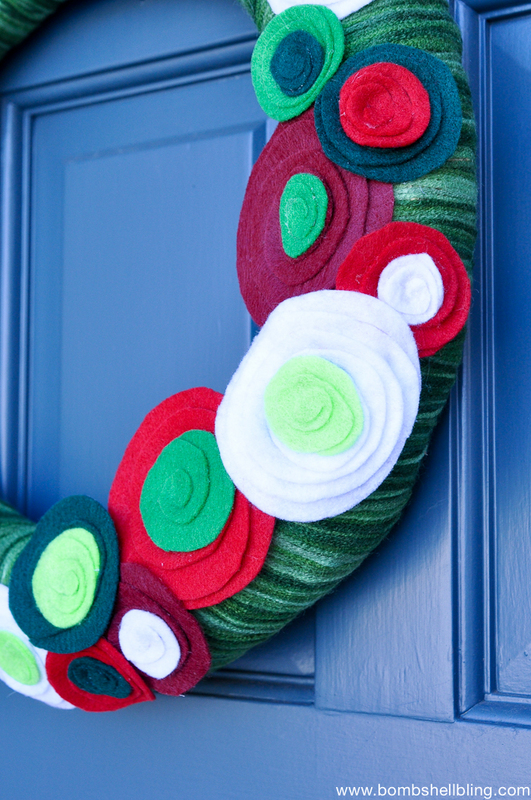 This wreath is SUPER simple. The only thing that requires even a tiny bit of skill is the flowers. However, although they are indeed simple to make, they are much more time consuming than I anticipated, so settle down in front of a favorite movie or reruns of a favorite show and get cutting and glueing. 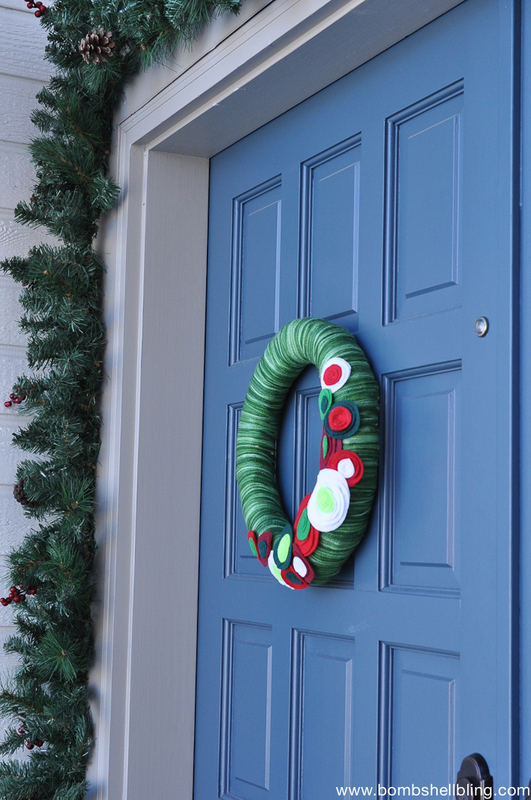 Tie the yard in a knot around the wreath. Stick dot of hot glue on it if you want to hold it in place. Now wrap, wrap, wrap, wrap, WRAP. That’s all you’ve gotta do. Wrap, baby, wrap! Once your entire wreath is wrapped tie a knot in the back (a dot of glue option, once again), and you are done with that part! 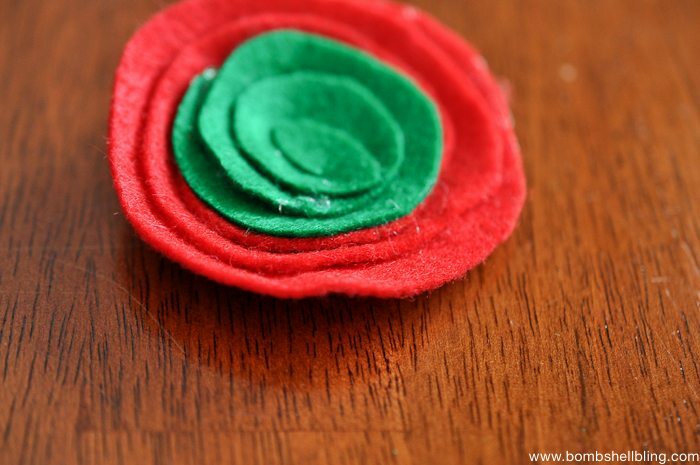 Time to make felt flowers galore. 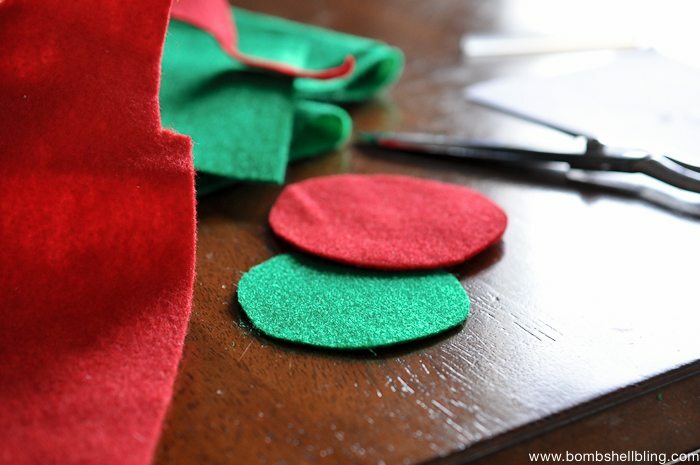 Gather up your various sheets of felt. Here’s a warning: HOT GLUE ENDED UP YELLOWING THROUGH THE CHEAP WHITE FELT THAT I USED. YOU HAVE BEEN WARNED. 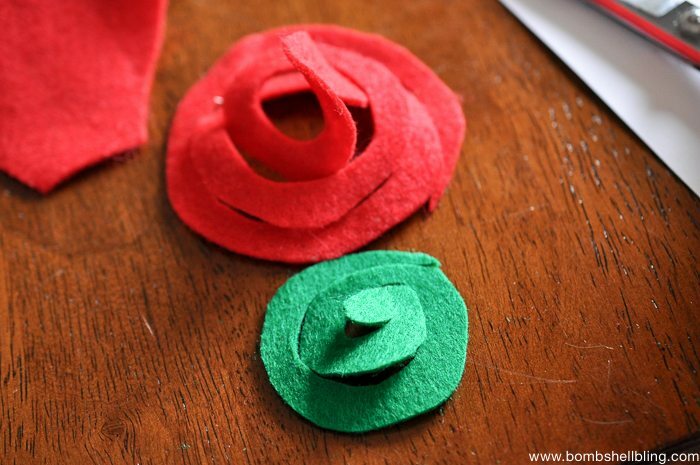 Cut circles in a variety of sizes and colors. Here is what you will do with those circles. 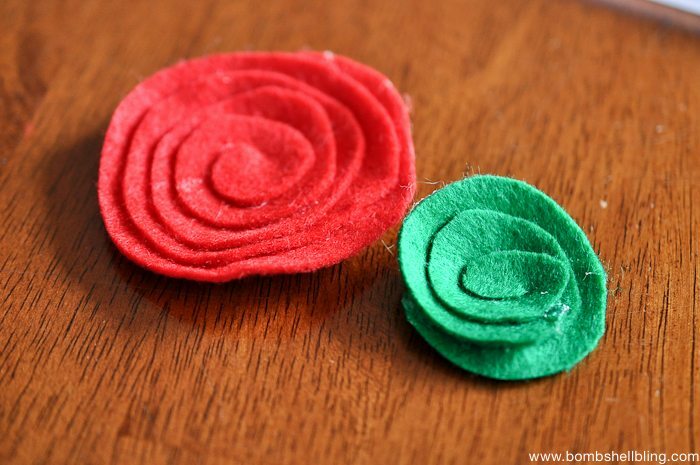 For each felt flower you are going to need two circles, different sizes and colors. Cut the circles in a swirled spiral, as shown below. Starting at the center, dab the tiniest bit of hot glue on the edges and sortof glue the spiral on top of itself to create a tight flower bloom. Do this for the entire spiral. Be careful – I always burn myself doing stuff like this with a hot glue gun. Complete both flowers. Glue the smaller flower directly on top of the larger flower, as shown below. All done! Now keep making flowers and placing them (UNGLUED) on the wreath until you like the arrangement. 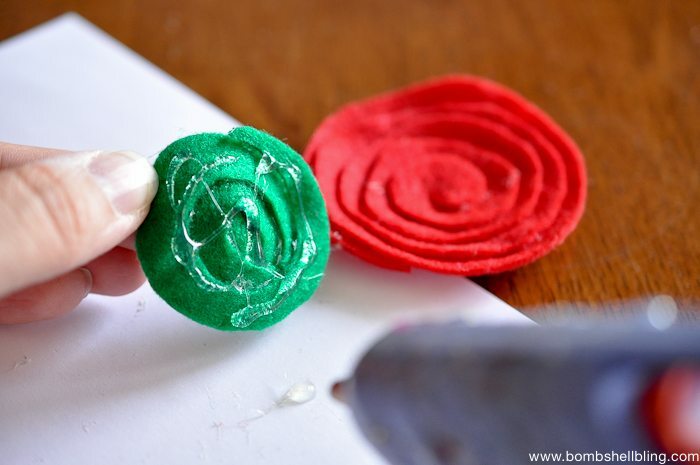 Use hot glue to attach them to the yarn covered wreath form. You are now finished! Here are a few pictures on our door. I hope that you are feeling inspired to make a new wreath (or two or three!) this holiday season after checking out our wreath blog hop. I know I am! Happy Christmas! 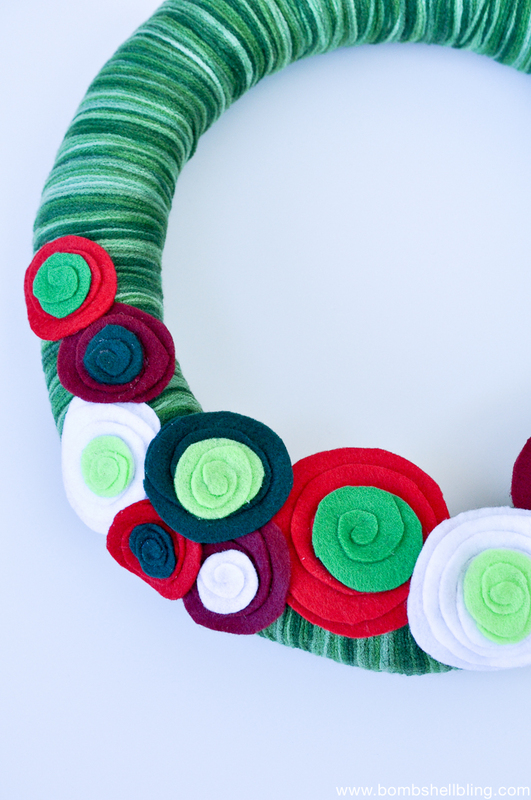 Love the festive felt flowers on your holiday wreath. So fun!! I love how fun this wreath is! The variegated green yarn is awesome! Your wreath is sooooo cute!! I just love those swirly felt flowers and they are perfect with that variegated yarn!! Super sweet! 🙂 Big hugs my friend – you are a doll. You are kind. Your wreaths are the most flawlessly breathtaking things I have ever seen. 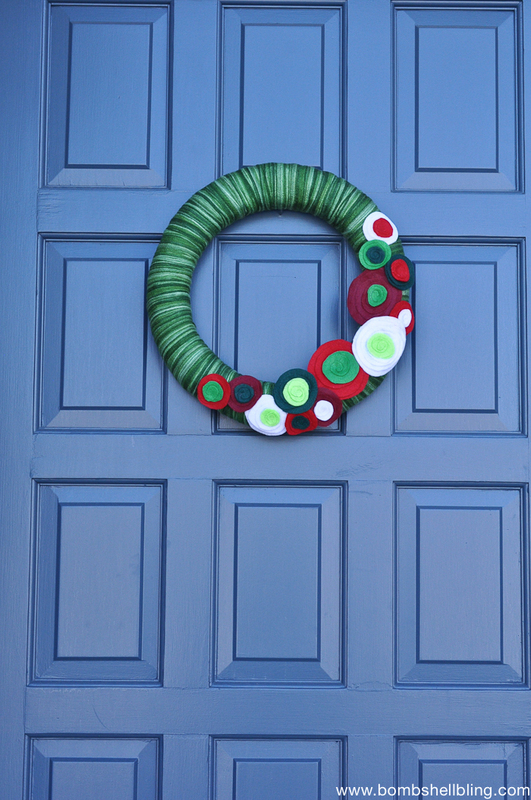 I instantly spotted your wreath in the blog hop image. Each one that you make is more amazing than the last!